...... Web Surfing, Chatting, playing games or any other computer activity. All this with the monitored user not knowing anything. Virtual Screen Spy is multi lingual as it comes in three languages: English, French and German; you only need to change the settings in the control panel menu to switch between languages. *With Virtual Screen Spy nothing will remain hidden! 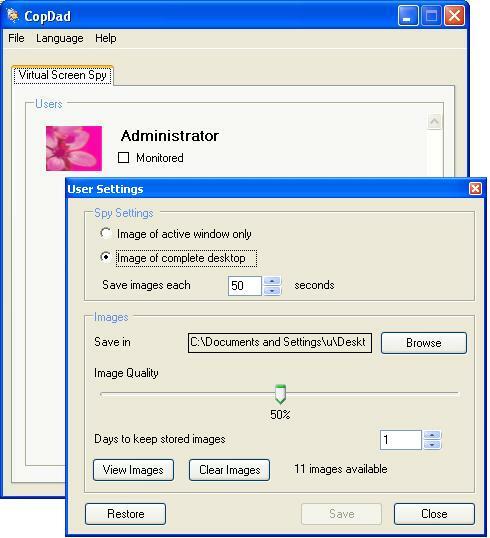 Screen-Spy freeware monitors your computers usage by capturing screenshots. PC Screen Spy Monitor secretly caputres your PC screen. Qweas is providing links to Virtual Screen Spy 1.2.2 as a courtesy, and makes no representations regarding Virtual Screen Spy or any other applications or any information related thereto. Any questions, complaints or claims regarding this application Virtual Screen Spy 1.2.2 must be directed to the appropriate software vendor. You may click the publisher link of Virtual Screen Spy on the top of this page to get more details about the vendor.